Plant Deeply . 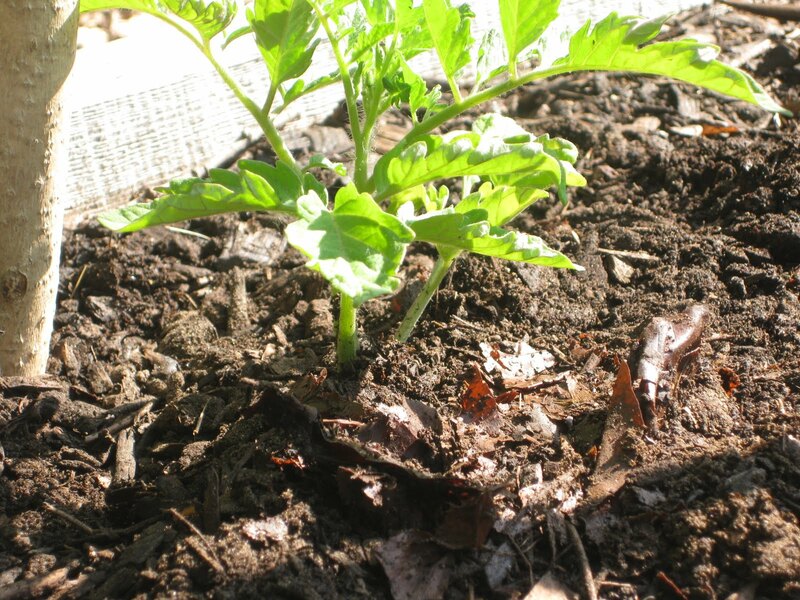 Bury the tomato right up to its first set of leaves (or even deeper). New roots will emerge all along the covered stem, giving the plant the strongest possible start. Provide Adequate Space. Set plants about 18 inches apart. Tomatoes need room to grow, and space for air to freely circulate. Water Wisely. One-to-two inches of moisture per week is sufficient; provide this via a slow-running hose set at the base of the plant. Overhead sprinkling, unless it comes from Nature, is to be avoided. Wet foliage invites late blight, an insipid fungal disease. Feed for Flowers (not Foliage). Tomatoes enjoy food, but beware too much nitrogen. Nitrogen will only encourage lush foliage, not fruit-making flowers. When I feed tomatoes, I give them the same high phosphorous mixture that my African violets, geraniums, and other flowering houseplants enjoy. Feeding begins when plants are a foot tall. Provide Support. 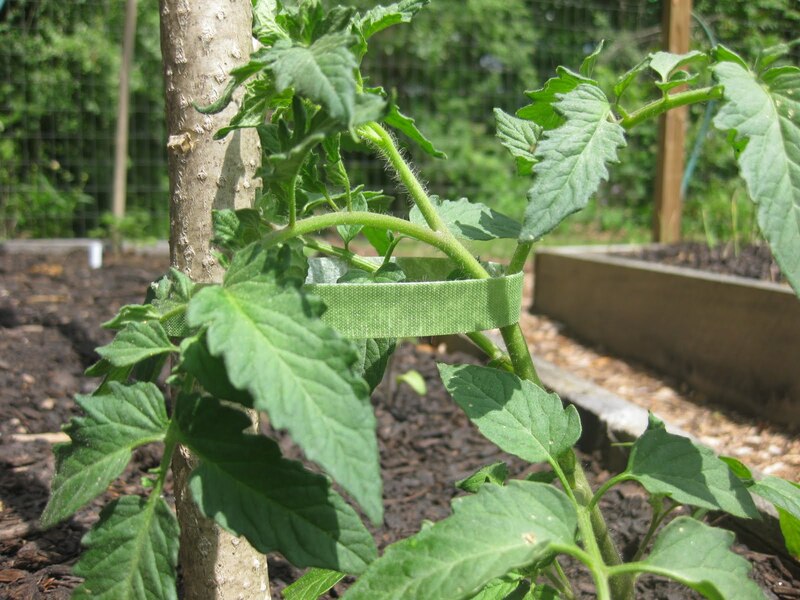 Tomatoes are vines, and need support of some kind in order to keep fruit off the ground. Most gardeners rely on wire cages for support, but I refuse to use them. Usually, the wires are poorly soldered on; furthermore, the contraptions are far too short for tall, indeterminate varieties. I depend on a 7-foot tee-pee trellis to provide both height and stability for the exuberant growers. I use green velcro tape to tie vines loosely to the trellis, as pictured above. Sever the Suckers. To encourage a higher yield, pinch off suckers. Suckers are energy-robbing offshoots that emerge between a tomato plant’s main stem and its leaf axils. If you want more tomato plants, simply stick these suckers in soil. They quickly grow their own set of roots. More details and photos. Remove all Volunteer Potatoes and Tomatoes. Potatoes, if forgotten in the garden after last year’s harvest, can quickly spread diseases to this year’s tomato-crop. 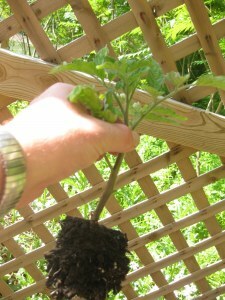 Ditto for volunteer tomato seedlings that sprout in the compost pile or garden. Be safe, and remove these potential threats the moment they appear. Hope for Sun. Last but by no means least, hope for a long, sunny summer. Tomatoes are tropical travelers that revel in long hours of direct sunlight. If, despite your good care, your plants fail to flourish, if growth seems stunted or flowers are too few, check over these tips for healthy tomato-growth. Briefly they are deep planting, deep watering at root level, high phosphorous-feeding, sufficient support, sucker removal, removal of volunteer potatoes and tomatoes, and finally, full-day sunshine. Want more gardening tips? 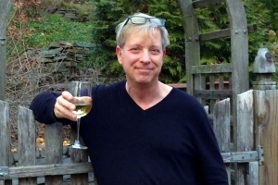 Sign up for Kevin’s weekly newsletter. Kevin, now you tell me! I planted six beefsteaks yesterday, with their long stems showing. Guess I need to replant them much deeper. Great tips, especially concerning “volunteer” potatoes. It's true that certain tomato-destroying fungi live on the live tissue of potato tubers that have over wintered in the garden. So beware if you grew potatoes last year and didn't get all of them out of the garden! Manny – welcome to A Garden for the House. Yes, it pays to look a “gift potato” squarely in the mouth! Yes, I am hoping for a long, sunny summer but not a terribly hot one! It's 94 degrees here today! I watered my tomatoes this morning, but they are wilting in this heat, just as I am! Ann Flowers – Thanks. So glad you enjoy the blog. 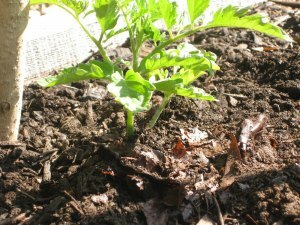 When I plant my tomato seedlings i usually cut off the lower leaves and plant the seedling at an angle with just the top leaves showing. This gives them even more of the root area to draw the nurishment from. It’s still too early to plant them here in Downeast Maine. After the last deluge of rain the soil is just too wet to do anything. Your gardens look great. Can you show a picture of what the suckers look like? I do not know what to look for. I can say this my cherry tomato has gone crazy and has gotten big (too big for the pot it is in, but I have not idea if I should replant it now or not. Thanks! Grazyna – That is a good way to plant. Hope you receive a little heat and not-too-wet weather soon. Constance – You can avoid repotting your cherry tomato plant if you remove some of the top growth. Details for removing suckers — and pictures — are here. 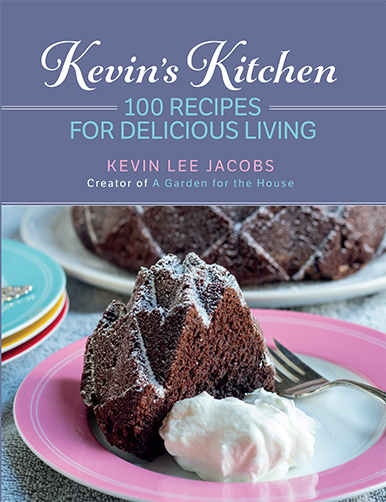 Kevin–Great post as always. Agree with you on everything. We do, however, use metal tomato supports. These are easy to resoulder (resolder) if need be, and are healthy because you can bleach them before you place them in the garden. They also last forever, if taken care of. what do you think of topsy turveys? I have two different variety’s in there and hoping this year for the best. I will go out tomorrow and cut the suckers off. Hopefully I will cut the right one! I didn’t think tomato plants came back but I have 2 new plants growing in my raised bed. I can’t believe it but we had such a warm winter. My plants suffered from bird (I think) attacks last year. I would find quarter sized holes in those tomatoes that were already red and ripe. Any tips on what I can do? Thank you! Thank you for great explanation on growing tomato. I am doing everything except fertilizing (I use home made compost). I bought a few different fertilizers (i.e. roses, shrubs, hydrangeas, MiracleGrow for flowers…..) and wonder, if I can just look for some on Sale late in the Season, disregarding who makes it. They seem to make a science out of it and fertilizers are labeled “for shrubs” or for roses” or …….. However, I just cannot figure on my own what is good for what. Every fertilizer has 3 numbers, I can find our what they represent, but I don’t know what is better for what i.e. roses, hydrangeas, grass. I don’t have African Violets, therefore I don’t have special fertilizer you suggest. I would love to read one of your posts explaining about fertilizers, numbers on them and for what is every number useful. Also how do you apply it yourself. Thank you. So enjoying your posts. Our fruiting tomatoes are about to overwhelm us. I started seeds as a lark from a lusceous tasting one from the market. I put the leggy plants in laterally in a raised bed. I snipped off the extra sprouts that “took” and stuck them in some water. They rooted and now have also fruited. I’ve had a great ‘first’ year with your help and encouragement. Thank you. Keep it up…Gratefully yours. Green coffee is easy to explain and understand’hence my attraction to it. I planted some tomato plants today that had little tomatoes on them already should I go ahead and remove them or are the fine to stay? We have a really nice volunteer potato plant growing in our now tomato patch. Hate to lose the potato, can I transplant it? If not I’ll get rid of it. Wanna get great tomatoes, no diseases!! The sucker stems always have big leaves, no fruit budding. Look for large leaves. You’ll find no fruit on those stems. KEVIN, I CAN’T FIND A PRINT KEY TO BE ABLE TO PRINT YOUR ARTICLES?